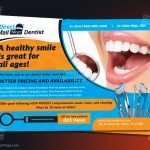 Cleaning service Direct Mail EDDM Postcard template for the cleaning service. It can be customized for any kind of promotion for a cleaning service, doctor, pharmacist or any other business if the layout is suitable for the content. This Every Door Direct Mail is designed in Photoshop. In order to edit this file, you will require Photoshop installed on your computer. Or you can buy With customization so we can help you will changing color, replacing text, images and logo and other info. Feature: Well organized Layered PSD file Easy to change color and style Free font used Print ready CMYK color format Free google font used (Font download URL included) Image Placeholder, Rally easy to replace images. 6×4 inch size .25 inch bleed Fonts Used: font download URL included on the download file. Important Note: – Images used are not included, – To edit this template you will require basic knowledge (Smart Object, layer, text) in photoshop. Please register or sign in first to contact Tushar.